I thought I'd take a one day break from blogging about food, and take this time to blog about something else that helps me sustain a healthy lifestyle -- my digital kitchen scale. What I love about my scale is that it tells me the exact number of grams in the food that I'm eating. Then, I can go on the web and look up the exact number of calories, fat, and fiber in my foods (my favorite place to look up food is Calorie King). The scale helps me when eating foods that don't come in pre-made servings (such as with fruits and vegetables, cheese, etc. ), and when combining foods into recipes. It also helps me when I want to cut a serving in half or into quarters (which I do a lot! ), letting me inject more variety into my meals and snacks. The best part about the scale is that it gives me the power to make my own serving sizes, customized to my lifestyle and diet plan. I *highly* recommend that anyone trying to diet or live a healthy lifestyle get a kitchen scale. I love the digital ones since they are the easiest to read, but non-digital ones are available as well (and are a bit cheaper). 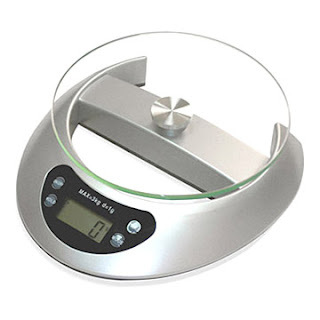 You can buy a digital scale online or at the mall or from the Yummy Diet Food Amazon Store. As far as I'm concerned, they are all basically the same. Watch out for bells and whistles, they are probably not that useful. You just need it to weigh your food!